Retire in South Carolina and one thinks of Rainbow Row in Charleston, golf in Myrtle Beach, and a state dripping with southern charm. It also offers ways for you to enjoy frugal retirement living. Let's see if South Carolina is for you. Lots of retirees are drawn to the past that you can feel in Charleston. A city of 100,000 that was founded in 1670. 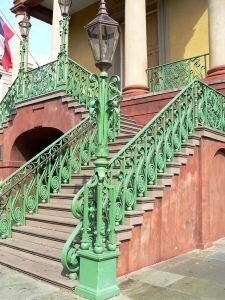 These are the famous steps on the Market Building, in downtown Charleston. It is start of a walk that will take you to unique shops, restaurants, fabled St Philip church with it's graveyard. Charleston was where the first significant battle of the Revolutionary War was fought, as well as the site of the start of the Civil War...Fort Sumter. History buffs will love retirement in the Charleston area. 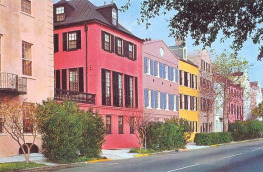 Rainbow Row is a well known Charleston landmark comprised of houses from the 1750s that were renovated in the 1930s. The homes were once shops of the various merchants that wanted to be close to the bustling waterfront district. Many had shops on the lower levels and residences on the upper floors. Retire in South Carolina can it be done frugally? Yes, if you avoid Hilton Head Island where the average house sells for over $600,000. South Carolina offers frugal RV life, Park Model Living, and Boat Life having a long coast line and Intercoastal Waterway running through the state. The average home price is well below the national average of $220,000. The average income is a low $27,000 per year. Besides Charleston where can I retire in South Carolina? 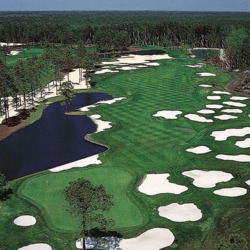 Myrtle Beach has 115 golf courses, not all with this many sand traps. It is heavily dependent on golf and tourism. It is a city of 27,000 and boasts 1800 restaurants. That in itself should make you confident you can find a frugal place to live in Myrtle Beach. Don't know many waiters living in expensive housing. Lots of RV parks to choose from, for the best rates stay for a while. Beaufort is a small town of 13,000, 35 miles from Savannah, that used to be the stomping grounds of Blackbeard. It is full of history, founded in 1709. Military retirees may be especially interested in retiring near Beaufort with 3 military bases including a hospital nearby. For those wanting a college atmosphere, Columbia is the home of the Gamecocks of South Carolina and Clemson is the home of the Clemson Tigers and Death Valley stadium. State sales tax...6%, when you are 85 it drops to 4%...? For those looking for southern charm , retiring in South Carolina should be on your list of best states to retire in. 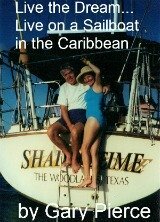 Mild winters, recreational opportunities in a slower paced style of life. You should check South Carolina out.